Final Cut Pro embodies powerful compositing features along with the ability to use a number of After Effects plug-ins. Note that the operant phrase here is "a number of After Effects plug-ins." Some simply do not work; others only have limited capabilities in FCP. There are simply times when only the motion graphics and compositing features of After Effects will achieve your desired result. Up to this point, the process of exporting to After Effects has been a cumbersome set of steps including exporting either a rendered QuickTime movie or a Final Cut Pro reference movie, creating a new composition in After Effects and then importing the movie you just created in FCP. After all of that, there are no layers, no filters, just a flat one layer movie. Apple's support of OMF now makes FCP an even more versatile tool for preparing media for external editing. OMF is an acronym for Open Media Framework Interchange (ok, so the "I" dropped out; that's what it stands for), an interchange format developed by Avid. 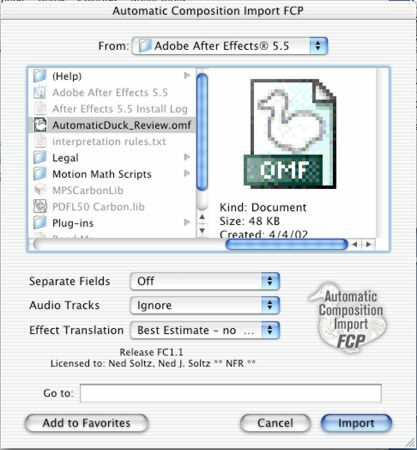 Built into FCP is the capability to export an OMF audio file for use in ProTools, as one example. Automatic Duck has now harnessed the power of OMF to export from the Final Cut Pro timeline to an After Effects composition. The Duck's earlier product enabled export of the Avid timeline to AE. I recall at NAB 2001 mentioning to the talented developer of this product, Wes Plate, that FCP users would certainly appreciate such a product brought to our editing platform. Well, I doubt that Wes remembered that suggestion over the din of the tradeshow floor, but last month that wish came true. Automatic Composition Import for FCP/AE brings the functionality of OMF timeline export to FCP. The installer contains two plug-ins, an export module for FCP and an import module for After Effects. Installation is straightforward. Activation is something else. Successful installation of the product requires entering a serial number included with the CD but also requires on-line registration which generates an activation code. It then creates two key files which are stored on your hard drive and which can be backed up in the event you need to reinstall the plug-ins. 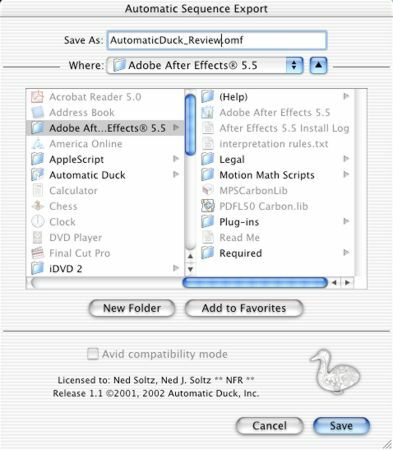 Once you have activated the plug-ins, you can copy those key files to the appropriate directory in your second OS, if, like many of us, you switch between OS 9 and OS X. The documentation explains it clearly. Now, I recognize the significant losses caused to developers by software piracy and those losses are felt particularly by small, innovative developers. Yet, an on-line activation protection scheme does make for a more complex installation and adds even more complexity to reinstallations necessitated by crashes or switching computers. It becomes even more of a burden on users without a live internet connection, requiring e-mailing Automatic Duck for an activation code. Personally, it was not a problem for me. I have a broadband connection on my G4 and activation was fast. If there has to be any additional level of protection, I suppose this is better than a dongle (I live in constant fear of losing my Boris Red dongle or when disconnected, having it carried off by the cat only to be found later at the bottom of the litter box). Bottom line here-don't steal the man's intellectual property. So, let's walk through a very simple project to see what ACI can do and what it cannot do (or rather, what OMF can do and what it cannot do). We start here with an FCP sequence where I have captured some video, marked in/out points, placed clips in the timeline and manipulated those clips. You will see that I first have three layers with V1 being a moving background (from the Jump Backs collection), in V2 some text, and V3 some footage to be used as a travel matte to show through the text (Travel Matte -> Alpha). From the rubber bands in the next sets of clips, you could easily tell that I have manipulated the opacity of these clips. So, immediately, we need to be aware of some of the limitations of OMF. These are clearly defined in the well-written and well-organized PDF file which serves as ACI's documentation. Basically, text layers, effects and filters do not translate. Motion filters like opacity, motion, scale and rotation not only translate but retain their keyframes, placing those keyframes in the AE timeline. We will see more of that shortly as well as the warning dialog for unsupported effects. In the case, I am going to export the entire sequence. If I wished to export only a part of the timeline, I would have set in/out points in the timeline. 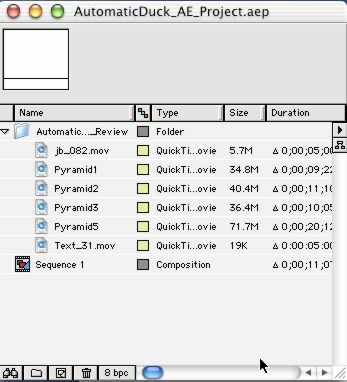 FCP would still export the entire sequence but would create an AE composition whose work area is equivalent to the duration indicated in the FCP sequence. I could then use the Trim Comp to Work Area command in AE to make the composition conform only to the desired work area. Note that the Avid compatibility mode check box does not work; there is no compatibility with Avid files. This is strictly FCP to AE. Since the operation is merely creating a small file to reference your original media, the export process is virtually instantaneous. Just name your export file and remember where you have stored it. Now launch After Effects. Choose File-> Import-> Final Cut OMF as Comp. Select your file. The next dialog box requires making a few choices. The first option allows for no separation of fields, upper field dominant or lower field dominant. This was somewhat confusing to me so I asked the developer for additional information. Essentially, you would only separate fields if the footage was going to be manipulated in a temporal or other way in which each field would be affected. For example, if the clip were to be scaled, then scaling effectively takes place in every field over the duration of the clip. Hence, fields should then be separated. This was unclear in the documentation and I would hope that future revisions of the otherwise excellent documentation might elaborate upon this. The audio option allows either ignoring the audio, importing the audio as a layer in AE or placing the audio in a subcomp. Note that the audio feature is less for manipulation of audio (AE has weak audio tools anyway) than it is for reference while working in the composition. The final choice allows four options: off, transitions only, best estimate no markers and best estimate markers. Off makes no attempt to import any effects. Transitions only will just indicate where a transition has been placed. Best Estimate will try to determine exactly what has been specified in FCP and will seek to indicate that. Markers are descriptive markers of what effect was applied. The documentation here makes a little mistake, referring to "the effect which was placed in the Avid timeline." But you get the idea. The import process is also instantaneous. But remember, I had a travel matte and a title in that sequence. This is what ACI says about that. Now, I have an AE project window window and an AE timeline. Note that all of my files are present, layered just as they were in FCP. 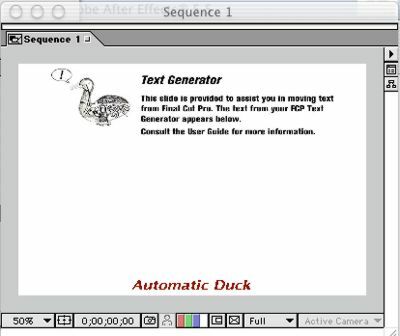 While the text is not supported, ACI generates a placeholder so that I could potentially replace that text using the AE text generator. Note that my other effects in the original FCP footage are also not supported (the travel matte I had applied to create moving footage within a title). I already knew this from reading the instructions; nevertheless, I included the effect in order to show that ACI will create placeholders in the AE Composition which I could replace with actual footage (in the case of the title) or to which I could reapply the transfer mode. Now, the FCP project is in After Effects. I can finish in AE and then render to whatever AE-supported output I desire. Note that there is no export filter to bring the finished piece back into FCP. There couldn't be such a filter owing to FCP's lack of support for many AE plug-ins, which is the reason I would be exporting to AE for compositing in the first place! Time for the bottom line. Is this product worth $395. The answer to that depends upon your needs. If you edit in FCP (which is what FCP is designed to do) but find that the compositing and motion graphics capabilities require AE, then this program is essential. Up to this point, all that one could do was import QuickTime movies or FCP reference files into AE and manipulate the entire file. The fact that ACI maintains the actual FCP timeline gives new meaning to today's jargon word "interoperability." The fact that ACI performs this conversion quickly and accurately provides it with immense value. For heavy AE users there is nothing like it and it becomes a must-have. Pros: There is nothing like it. And it provides fast and accurate OMF export from FCP to AE, retaining the time line. Reasonable price for target users. Cons: Not all effects supported, which is a limitation of OMF itself. Some documentation could be a little more detailed. Pricey for the casual FCP to AE user.